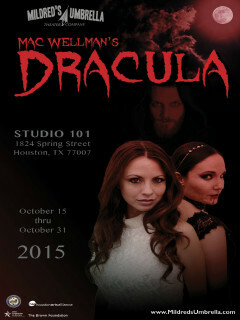 Mildred’s Umbrella Theatre Company continues its 2015-2016 season with a return engagement of Mac Wellman’s Dracula, a bizarre and offbeat version of the Bram Stoker classic that is campy, dark, and fun – all told through the unique words and voice of Mac Wellman. Originally produced in 1987 at River Arts Repertory in Woodstock, NY, Mac Wellman’s Dracula tells the story of two sexually repressed women who find freedom and passion in the vampiric world of late Victorian London. The play takes the basic premise of the vampire legend and ramps up the sexual connotations – to a point where the focus of the show becomes more about Dracula’s female victims. $15-$20; Closing night Halloween Party: $10 for Oct. 31 ticketholders, $20 at the door.